A great idea if you wanted to have a BBQ but the sun’s just not out! Cooking the chicken in this way really helps to keep it succulent and takes half the time of normal roasting. 2. Take your chicken and remove any giblets/string etc that may have been packaged with it. Take a large sharp knife and very carefully, cut through the top, middle of the bird – basically follow the middle bone between the two breasts. You will have to break through some bones so be sure to apply some pressure. (Be careful though not to cut all the way through to the bottom half of the bird! )Once you’ve made your cut, flatten out the bird so that the wings are resting on-top of the breasts and the legs are splayed out on each side. 3. Take your skewers and pierce through the leg and the breast of each side so that the skewers go into a criss cross through the bird. This will make handling the chicken much easier when turning it and taking it in and out of the oven, as well as conducting heat from the skewers through to the centre of the bird. 5. 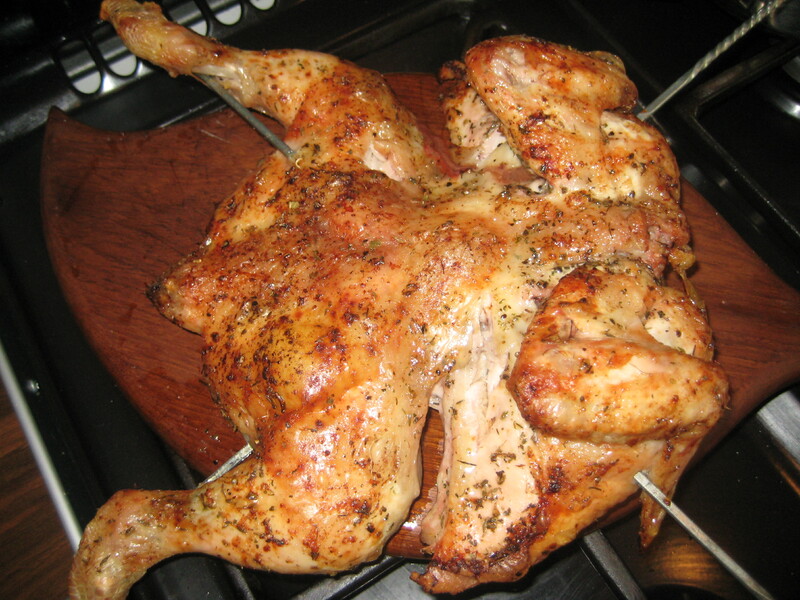 Place the bird directly onto top shelf of your oven and place a baking tray onto the shelf below it to catch any juices. 6. Turn your bird every 20 minutes for approx 1 hour or until all of the juices are running clear and you cannot see any blood. This is great served with roasted sweet potatoes (they can be cooking in the baking tray below the bird in the chicken juices) and beetroot with green beans and feta.